This Lebanon, New Hampshire motel is next to White River and a 5-minute drive from White River Junction Amtrak. Sunset Motor Inn offers river views, a continental breakfast and rooms with free Wi-Fi. 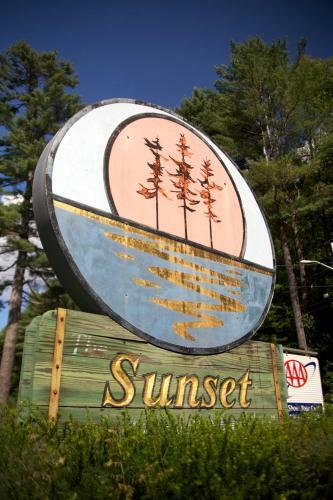 The Sunset Motor Inn is located on the bank of the Connecticut River, surrounded by trees, in one of the most scenic and popular areas in northern New England. For over 50 years the Sunset has been proud to offer the very best in quiet, clean, attractive rooms at the most reasonable of area rates. Year round, the riverview from most of the rooms is unsurpassed. Each room has free local telephoning, a computer jack, cable TV, private shower and/or hathtub, its own temperature control, fan, air conditioning ( in season), comfortable beds (queens in most rooms), and other amenities. For longer steys, four rooms have microwave/refrigerators, coffee pots, toasters, utensils, tub/showers, and large windows on the river. The four rooms can be made into two suites. Refrigerators for other rooms, hair dryers, irons/ironing boards, and rollaway beds are available upon request. The extensive continental breakfast is complimentary. Our widespread use of flowers has made us one of the most photographed motels in New England.